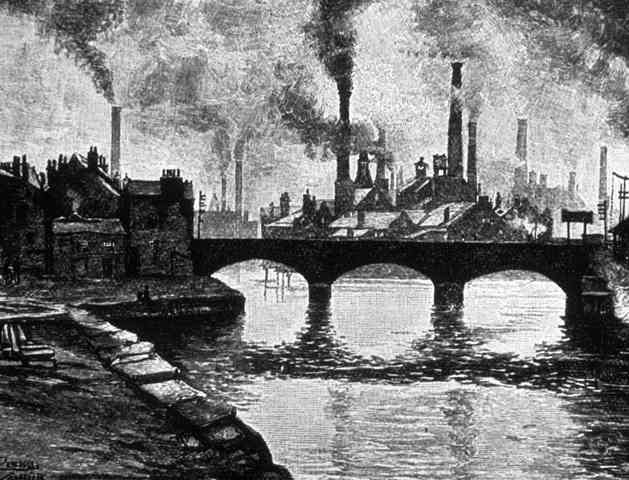 The industrial revolution brought an urban economic boom. As manufacturing centers began to replace agriculture, unsanitary conditions started to occur. "Urban populations rose drastically in the 19th century and a host of problems became apparent. The incredible density created highly unsanitary conditions. Overcrowding, corruption of government and economic depressions promoted a climate of social unrest, violence, labor strikes and disease." Factory towns were not visually appealing because the heavy machinery left a layer of soot from all the coal burned. "The new cities were ugly to the nineteenth-century eye: raw as a new suburb and dark with the soot from burning coal. Contemporary observers were appalled by the impact of what poet William Blake described as the “dark, Satanic mills,” on the physical landscape."